Often when we think of fashionable dress, especially historical costumes, we think of the people who wore the clothes rather than those who fabricated them. This can be especially difficult when a costume has passed through many hands, and been worn by many people, over the centuries. As LACMA prepares to exhibit its recently acquired collection of eighteenth- and nineteenth–century European costumes and accessories next fall, its textile conservators have been working arduously to unravel the past. 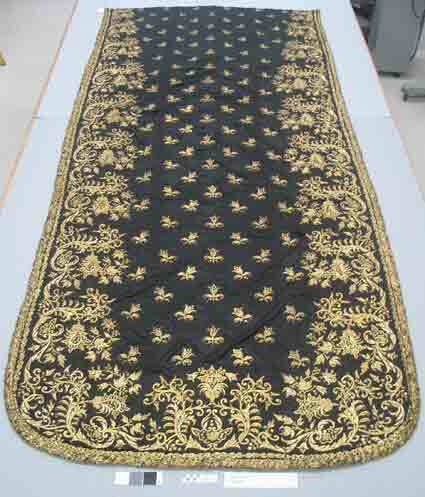 After careful examination and research by conservators, a black satin court dress with gold embroidery—purportedly worn by Queen Maria II of Portugal in 1850—was found to have been altered, cut, and reused sometime after its royal ownership. 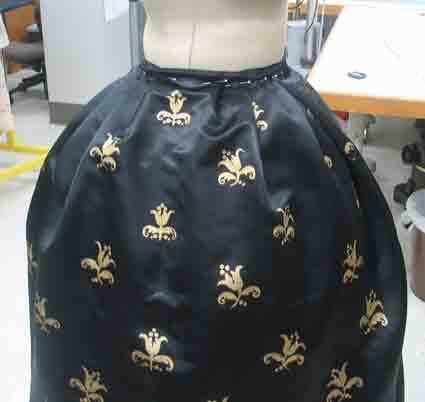 The task at hand for the conservators was to determine how the court dress was originally worn. The three-piece gown, consisting of a bodice, skirt and train, arrived at the museum with an additional bodice and a collar. These two extra pieces, dating from the 1890s, presumably were used for a fancy-dress ball by a new owner. The main problem posed to conservators was the court train. The top of the train was crudely cut off to provide fabric for the second bodice and collar. In its present state, the top edge gave no clue as to how the train originally had been pleated. Several mock-ups of the train were created so that we could determine, without handling the original train, the best presentation of embroidery, volume, and position in relation to the petticoat. The goal was to create the silhouette of the 1850s, to show the embroidery to its best advantage, and to gather the fabric in a way that minimized its bulk. At first, the top edge was gathered using a narrowly spaced inverted box pleat. Later, historical research was found to support a widely spaced box pleat. After meetings with curators with the various mock-ups, a final box pleating arrangement and position over the petticoat were chosen. Now conservation work on the actual train began. To even out the top edge of the train and to avoid damaging the original fabric, a narrow strip of modern fabric was added to the top edge. It would be this modern fabric that would receive the pleats and stitching to a modern waistband. 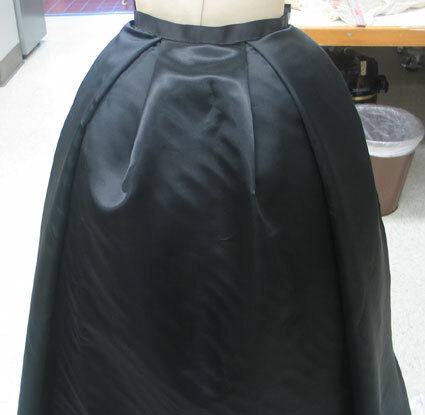 A new black satin silk, matching in weight and tone of the original train, was hand sewn to the top; the gentleman who had sold the material to us was quick to mention that the same type of fabric had been used for a cape in one of the Batman films, making the piece a bit more heroic and unique. History has been mended. 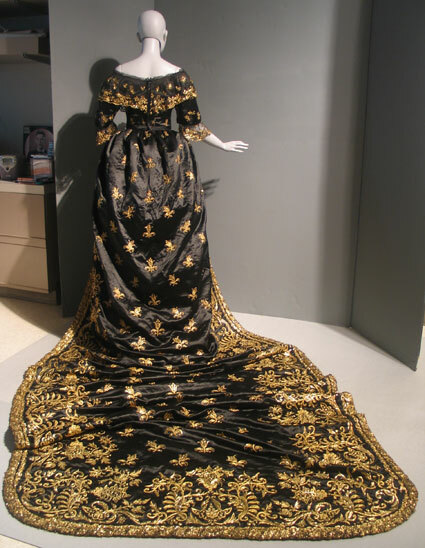 The Queen Maria train will be featured in the upcoming costume exhibition at LACMA in the fall of 2010. Followers of our Twitter account know that we have three able tweeters here at LACMA—Allison, Devi, and Erin. In light of the impending Turkey Day this week, we thought we’d give them a break today and turn Twitter over to an art- and food-obsessed guest. Through some proprietary technological advances which we are not at liberty to divulge, we hacked into eighteenth-century still life master Luis Mélendez’s Twitter feed and will be sharing some of his tweets throughout the day. Luis was on Twitter a lot back in the day—starting when he worked in his father’s studio, through his days in school, and all the way up to the end of his life when he died a pauper. After culling through his many tweets, we’ve gathered up a greatest hits that tell of all his ups and downs—mostly downs, by the way. Follow Luis all day today to get the story of his (mostly miserable) life. If you’re coming to this series late, you can head over to Twitter and search #miserablemelendez and all of his tweets should appear in one place. What I like about working at a museum is running into curators who offhandedly tell you something really interesting about art that you didn’t know and never would have found out otherwise. 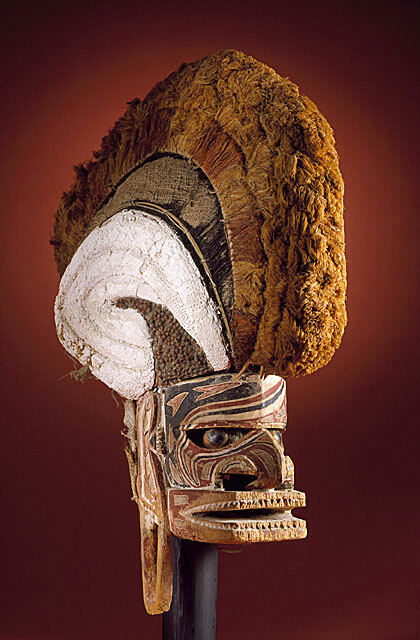 Not long before Art of the Pacific opened, for example, I happened to meet Nancy Thomas, museum deputy director and curator, as she was about to enter the galleries. So Nancy kindly gave me a spontaneous tour of the installation, pointing out the canoe prow, the skull rack … and the operculum eyes. The operculum is a convex rounded plate that serves as the trapdoor on the shell of a number of marine snails and some land ones too, protecting the snails from predators and from drying out. The operculum has a smooth side and a rough side. Set into a sculpted face of approximately human dimensions, as some long-ago artist discovered and many others would confirm, an operculum with the smooth side out makes an uncannily convincing eye: soft, three-dimensional, with an irislike ring of color around a glossy dark center. The opercula are individual as well, each one forged by the life and times of a lone maritime snail. 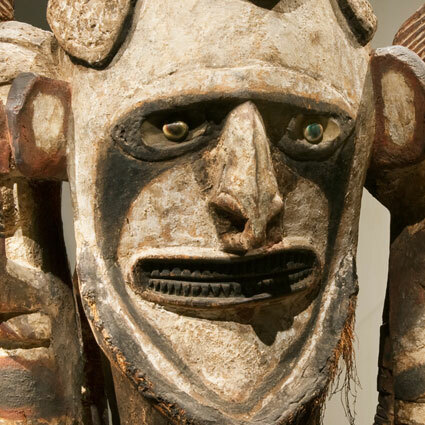 As eyes they give the masks or statues a strangely personal presence and almost an air of distraction or being lost in thought, as if the figures represented were trying to sort out some important things on their minds. Well, Wendy didn’t get the object in question, a renowned A. H. Mackmurdo chair that is universally believed to signal the start of Art Nouveau. 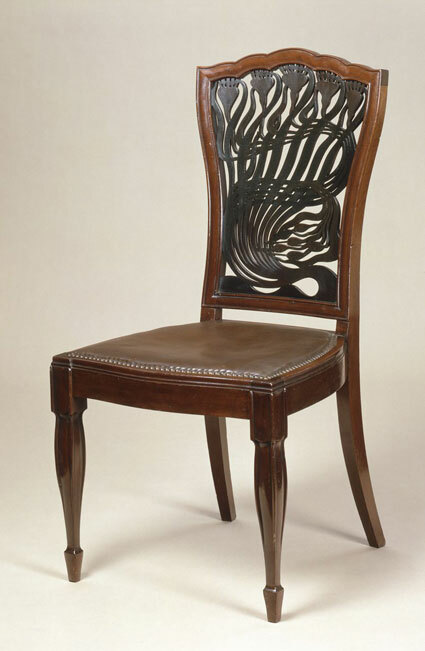 As Wendy mentioned to me last week, she’d identified the chair via a London dealer last fall and was crestfallen when it wasn’t one of the works selected to enter the permanent collection in the spring of 2008. What happened next is a story of extreme curatorial perseverance. 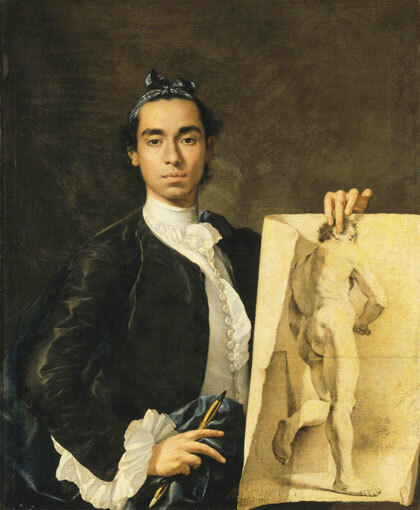 Determined to bring this seminal piece of art to LACMA, she connected with colleagues at the Huntington to discuss a joint acquisition, figuring it would be easier to raise half of the money needed than the whole pot. If you have the pleasure of knowing Wendy—she’s beyond smart and charming—then you instinctively know that she of course made it happen. The Huntington was game and so were LACMA donors, including longtime supporters Max Palevsky and Jodie Evans and an early fan of the chair from the outset, MaryLou Boone. (Wendy said had it not been for MaryLou, she might have given up somewhere along the way.) Many months passed and ultimately, Wendy said, she has never poured more time and energy into bringing an object to LACMA than with this remarkable work of art. When I asked Wendy to describe the impact it has had on her she noted simply that it’s “That Chair.” Now, along with our friends at the Huntington, we can also say that it’s our chair. The chair will go on view at the Huntington in December. Those of us who are from Los Angeles are lucky enough that several of the photographs in New Topographics: Photographs of a Man-Altered Landscape are in fact our very own man-altered landscape. 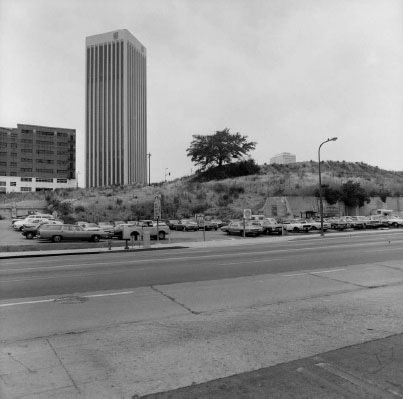 While the likes of John Schott, Joe Deal, and Nicholas Nixon were out investigating motels along Route 66, scaling hillsides in Albuquerque, and hauling 8×10 cameras to the umpteenth floor in Boston skyscrapers, respectively, Lewis Baltz, Frank Gohlke, and Henry Wessel were making photographic history with the landscapes of Los Angeles and Orange County. I happened to be in Irvine last week and got the notion to seek out some of the locations that Lewis Baltz shot for his series The New Industrial Parks Near Irvine, California, which are on view in New Topographics. Baltz titled his photos with addresses, so these locations weren’t so hard to find. Some of the buildings, however, had apparently been digested into the maw of Irvine’s vast expanse of business complexes. Out of nine locations I visited, I only found three of the buildings seen in four of Baltz’s photographs. Left: Lewis Baltz, North Wall, Semicoa, 333 McCormick, Costa Mesa, 1974. Right: Semicoa today, with fewer trees and conspicuously missing that eclectic logo of yesteryear. Left: Lewis Baltz, Southeast Corner, Semicoa, 333 McCormick, Costa Mesa, 1974 Right: Another angle of Semicoa today. They fortified their gate and built a ladder to the roof! Left: Lewis Baltz, East Wall, Business Systems Division, Pertec, 1881 Langley, Santa Ana, 1974. Right: Today it’s Concept Development, Inc.—and that’s grime clouding the windows. 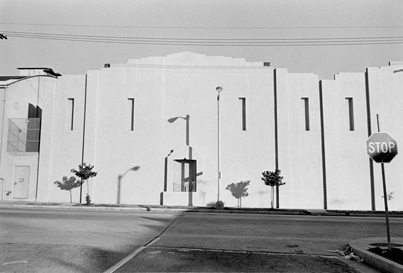 Left: Lewis Baltz, South Wall, Unoccupied Industrial Structure, 16812 Milliken, Irvine, 1974. Right: Industrial Structure today, now occupied, and with a fence nearby. I’m not the only one being clever like this, however—Britt Salvesen, curator of the present incarnation of New Topographics, also got an email from photographer Brian English reporting that he had visited the location of Frank Gohlke’s photograph Landscape, Los Angeles, 1974, at North Hollywood Way and West Clark Avenue in Burbank. And to put the icing on the cake, he just happened to catch a 1970’s Plymouth Gold Duster tooling by as well! Left: Frank Gohlke, Landscape, Los Angeles, 1974. Right: Photograph by Brian English. So—how about a challenge? Take a look at the photographs by Frank Gohlke and Henry Wessel below. Do you know where in Los Angeles these were taken? Leave a comment if you know the street intersection—or take a picture yourself and give us the link. Happy hunting! PS don’t forget about our weekly New Topographics tours; Shannon Ebner will be leading a tour this Sunday. 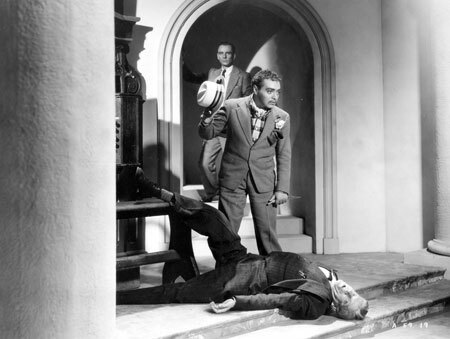 His films consist of a series of small “amusing” melodramatic situations: the murderer’s button dropped on the baccarat board; the strangled organist’s hands prolonging the notes in the empty church; the fugitives hiding in the bell-tower when the bell begins to swing. Very perfunctorily he builds up to these tricky situations (paying no attention on the way to inconsistencies, loose ends, psychological absurdities) and then drops them: they mean nothing: they lead to nothing. Hitchcock made a career of crafting films concerned more with the chase itself than with the impetus for the chase or the consequences of getting caught, getting away, or saving the day. At the end of North by Northwest, as Cary Grant and Eva Marie Saint find themselves safe from pursuit—yet still dangling perilously from Mount Rushmore—Hitchcock simply cuts to the couple safe and sound in a train for a quick and tidy resolution. The director seems to say “there is no danger but the chase.” Come on: we all know no one’s falling to their death unless they’re pushed. Over the last few months I’ve had the pleasure of working with the curators of Heroes and Villains: The Battle for Good in India’s Comics and two of the artists featured in the exhibition, Mukesh Sing and Jeevan J. Kang, in commissioning limited-edition prints inspired by the show. Having been steeped in this contemporary component of the exhibition, I was excited to see the Indian paintings that make up the other half of the show, now that the exhibition is open. With the help of co-curator Tushara Bindu Gude, I learned more about these works, each depicting a fascinating world with animal and human fiefdoms vying for power. My favorite work in the show is a nineteenth-century painting that recounts part of the ancient story of Ramayana, aka Adventures of Rama. Sugriva, king of the monkeys, makes a deal with Rama to help him free Sita (Rama’s wife) from captivity. 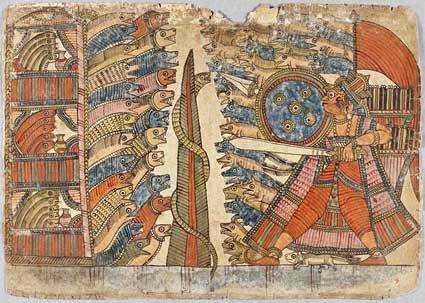 But Sugriva has one condition—Rama must help him overthrow Sugriva’s older brother from whom Sugriva stole the throne. 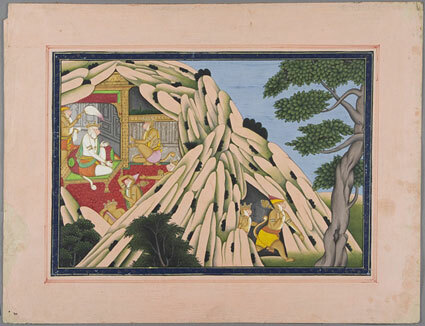 The painting shows us Sugriva ensconced on his opulent throne within a cave and surrounded by members of his court. His loyal general, Hanuman, is shown rushing out of the cave to galvanize an army of monkeys and join Rama in his quest to free Sita and defeat her captor Ravana. It’s an exquisitely rendered work with saturated colors and incredible details. 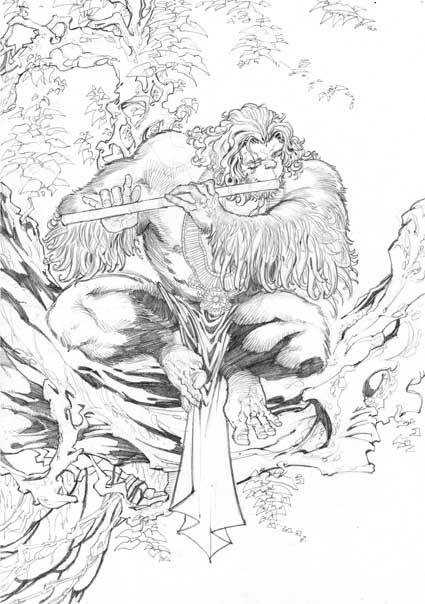 In the next gallery, a modern version of Hanuman is imagined by a Liquid Comics artist, Abishek Singh, in a serene moment perched on a tree branch and playing a flute. 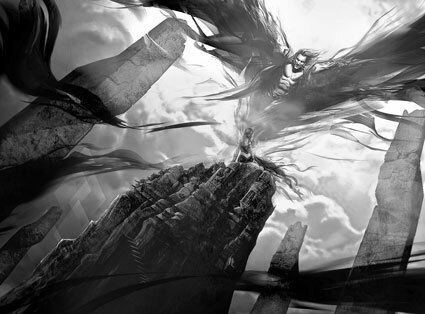 Today, Liquid Comics has brought new life to the amazing myths and stories of ancient India. More info can be found here should you want to bring a little bit of the mythical into your own home. You are currently browsing the Unframed The LACMA Blog blog archives for November, 2009.